This is the CD-ROM only version of this popular title. Contains the complete contents of the book, fully searchable, with interactive table of contents and index, in Adobe's popular portable document format (PDF). 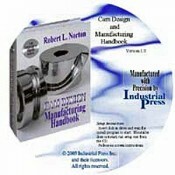 Additionally, this unique book is accompanied by a 90-day trial demonstration copy of the Professional Version of Dynacam for Windows V. 7.0. Written by the author and used worldwide, this program solves the equations described in the book and allows in its fully licensed version the design, dynamic modeling, analysis, and generation of follower center, cam surface, and cutter coordinate data for any cam. It also defines conjugate cams for any application. Also included are 90-day trial demonstration copies of programs Fourbar, Sixbar, and Slider for the design of cam-follower linkages.